Our reviews of best trampolines only. 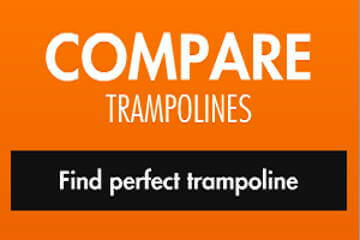 Choose trampoline which will best fit your jumping needs! Ask anyone who already owns a trampoline and they’ll tell you it’s the best thing you can have in your garden. Kids just love to jump, and a trampoline helps any child over the age of three keep fit and active while having fun. Trampoline, as a perfect training equipment, will give you just that – endless hours of fun. 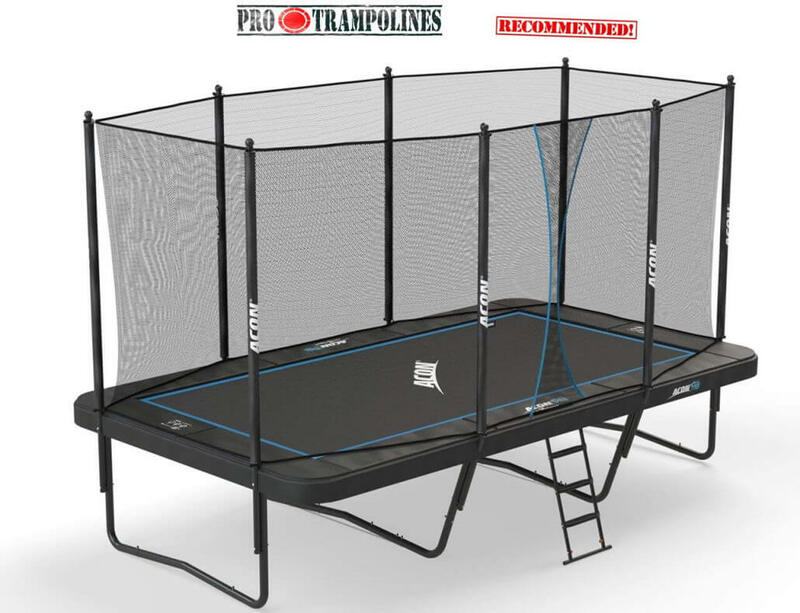 Make sure to only buy best rated trampolines – read our trampoline reviews or see trampoline comparison chart to find trampoline you truly deserve. If you are worried with safety issues trampolines represent, try to get over it as health benefits greatly surpass possible injuries. Keep up to safety guidelines, determine some rules and you`ll be fine. 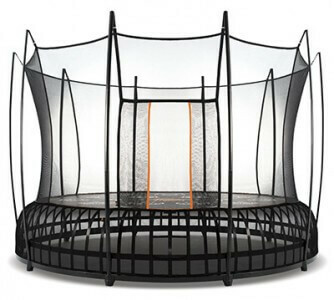 Well, this is not to easy question to answer as price range for professional trampoline can go up to $15 000, while prices for recreational trampolines vary from several hundred to several thousand dollars. You can also check our comparison chart and easily browse by selecting desired type, shape or size of your preference. 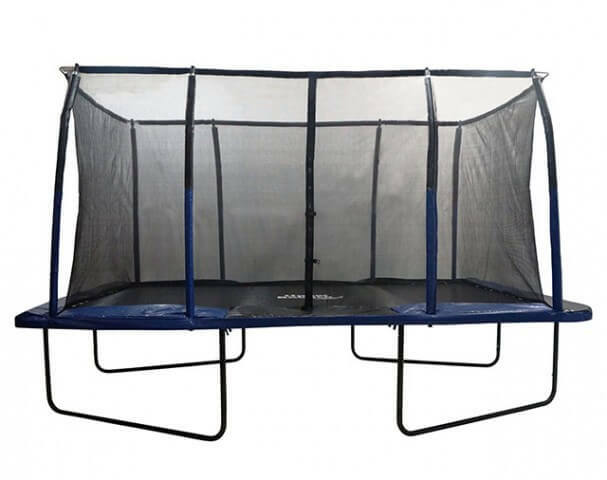 If you’re in the market for a rectangular trampoline, you might seriously want to consider this model as ACON rectangle trampoline is currently considered one of the best rated trampolines of all times. Designed in Finland by a Finnish company ACON with ample experience in trampolines, this trampoline ticks all the checkboxes – it’s fun, sturdy, and safe. 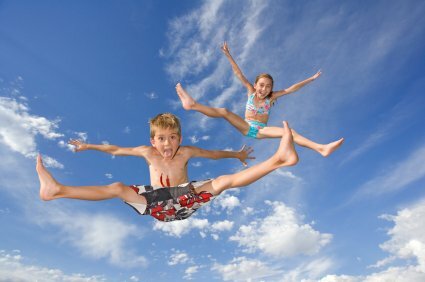 Kids jump higher and happier than on any other trampoline we know of, and except “Vuly Thunder“, which is not so good at characteristics but do play significant role in terms of beauty. If it will need maintenance no need to worry as new replacement parts, from pads, mat or net, or even additional accessories as basketball hoop are easily ordered online. Your friends who have maybe gone cheap will definitely need to replace parts more often than you will, even if you leave it outside during winter. So it is worth the investment for safety and piece of mind. And if you don`t mind, your yard will become neighborhood’s play destination of choice due to this trampoline! An impressive 120 sq. ft. of jumping surface is at your disposal and the folks at ACON assure us that there is NO weight limit for practical purposes (stated at 800 lbs). ACON is so confident that their product is of great quality that they offer an absolutely amazing warranty – 5 years (!) on the mat and frame and a year on other parts. The trampoline is large and bulky so make sure you have enough space in your yard and while the assembly is not too difficult, it takes time due to how large the trampoline is. It certainly does pack a huge amount of fun as the bounce is great thanks to 140 pieces of 10″ springs, so jump is insanely high. ACON certainly didn’t cut any corners with this model and the price is high but certainly appropriate for a model of this caliber. Recommended as #1 in rectangle trampolines! This unique square trampoline by Springfree (who else) is bound to be of interest not only for trampoline enthusiasts, but to laypeople as well. This is the first smart trampoline on the market! It features the tgoma outdoor interactive digital game system. There are various games available that you beat by jumping on the trampoline. The tgoma game system requires you to set up a tablet and install the app; the sensors do the rest. It’s a lot of fun and it’s safe, as the games are designed for a single user. The springless trampoline, as we have pointed out many times before, is a great way to bounce safer as there is less injury risk. The enclosure also helps – it’s called FlexiNet and is resistant to tearing. The enclosure rods bend and adapt as you go – you can’t hit the enclosure pole anymore! 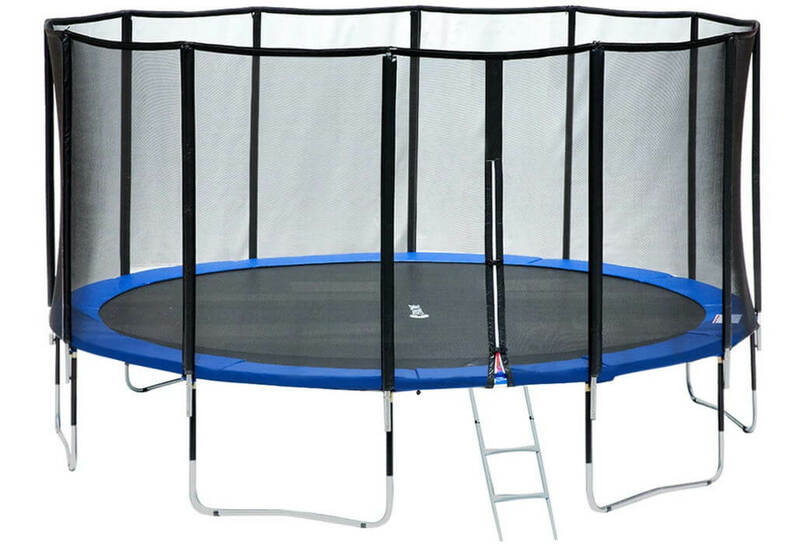 The sturdy frame is situated beneath the jumping surface so you cannot hit it. The SoftEdge mat can withstand 5,000 hours of sun exposure – magnificent durability. 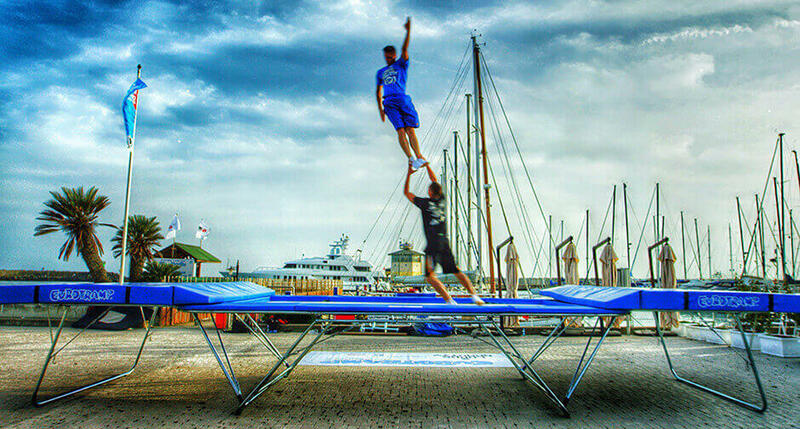 The 13 ft. of square trampoline is equivalent to 16 ft. round trampolines, so bear that in mind (155 sq. ft. of jumping area). There are no springs; 80 flexible composite rods are used instead. There is a 220 lbs weight limit, but we feel it’s a conservative number. If you register it, the warranty period is 8 years on the frame and 2 years on other parts. Yes, the price is very high, but there really isn’t anything even remotely similar to this on the market. The “tgoma” gaming system has upped the ante and the overall package is among the best in the world. Designed in the Land Down Under, just by looking at this trampoline you immediately begin to understand that this really is something special. Wacky Australian designers from Vuly have impressed us over and over with their quality trampolines, and Vuly Thunder did too. For starters, Vuly trampoline is extremely safe. Due to its unique spring(less) design, there are no safety pads – you can’t land on the springs as they are not there. Dense UV-rated Silk Terylene net is sewn directly on to the mat for maximum safety. You must have noticed the weird symbols on the mat – it’s the Vuly HexVex game that provides hours and hours of fun. The symbols won’t fade as the mat is made of Bisonyl. The main reason for the unusual looks is the spring system of this trampoline. It uses the unique leaf springs (70 in total) that provide one of the best bounce experiences on the market. Most of the energy is reflected back which means the bounce is higher and more responsive, much better than with coiled metal springs. The assembly is very easy – parts just click together and there are no nuts and bolts. The warranty is fine, but nothing phenomenal when you factor in the price – 10 years on the frame, 5 on the mat and a year on everything else, but at least all parts are half the price for life if you keep the receipt. Still, if you’ve got the money, it’s either that or the Springfree trampoline. There’s hardly anything better on the market. Outstanding! Another trampoline and biggest competitor for SpringFree Inc trampolines, Vuly has several exceptional models of trampolines which bring innovative designs you surely never seen before. Fantastic looks, best in the class bounce and quality of used materials really make Vuly Thunder trampoline stand out from the crowd. Read full review from link below. Okay, now it’s time to breathe deeply and get ready for a surprise. This one is easily the most innovative trampoline we’ve seen for this season and we’re simply blown away by it. 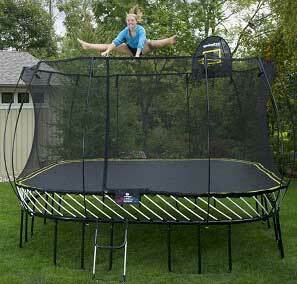 Jumpsport is a reputable company known for making the best trampolines around. This model didn’t disappoint either. Compared to the last year’s AlleyOOP PowerBounce Trampoline, this one features, guess what, two mats, yes, two separate mats with an outstanding total of 192 springs (128 primary + 64 secondary), as opposed to 144 on the PowerBounce (which is still an amazing number for a 14 ft. trampoline). These models feature the so-called Power Springs along with the regular ones. What sets this trampoline apart from others is the ability to customize these Power Springs to your liking. 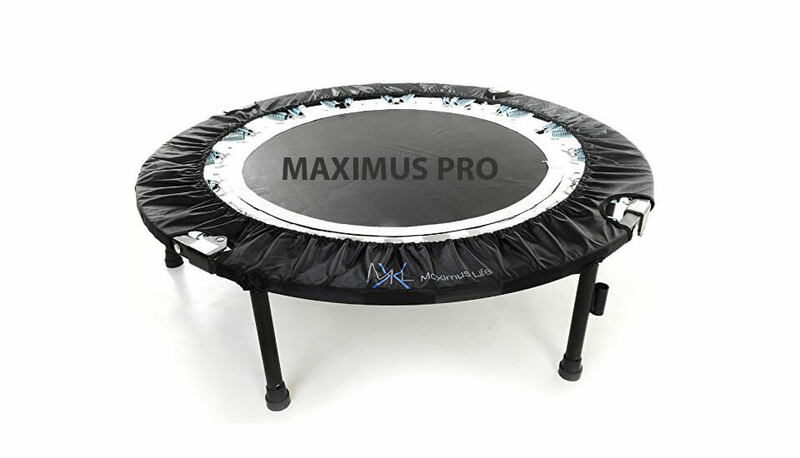 You can make the trampoline bounce higher or lower by adjusting the stiffness of the springs and the bounce itself is literally out of this world; likely the best in class. The trampoline can therefore be customized to be optimal for all weights and ages. Jumsport’s Air Shock safety system is there to bring you a peace of mind by utilizing a double-bed system. The so-called Double Bounce system helps reduce impact forces by up to 50 per cent. The two trampoline mats act in tandem to distribute the forces (like an airbag) and the experience is out of this world! Permatron mats have fantastic 10 rows of stitching so expect very long life span out of it. The frame is one of the thickest around and safety is top-notch. It is limited to 300 lbs but has withstood 800 lbs in real-life testing. Various accessories are available, such as ladders, tents and basketball sets, but they cost extra. We recommend you purchase a ladder due to the height of the trampoline. 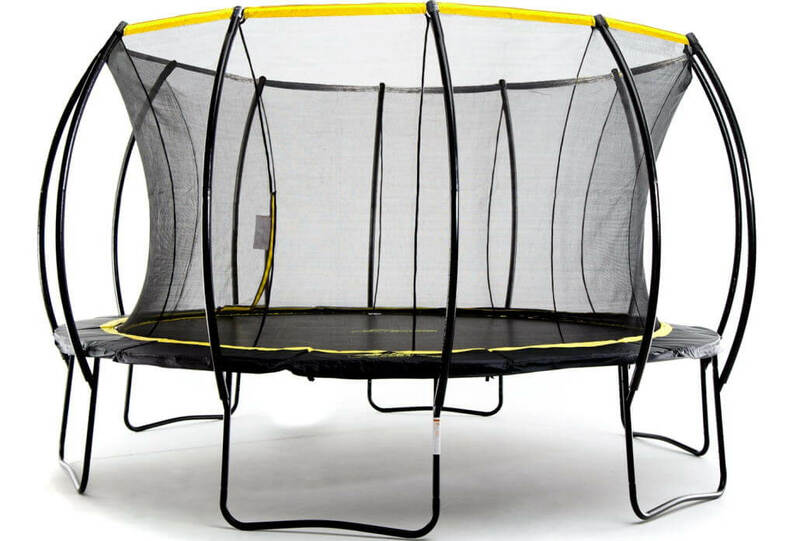 The cost of this trampoline is about two or three times that of ordinary trampolines, but this one is far from ordinary. With a lifetime warranty on metal parts, 5 years on other parts and two years on the pads, it only shows the level of quality JumpSport provides. Their Fail-Safe online guarantee can extent these periods to 10 years, which is unheard of in the world of trampolines. It can be assembled by 2 people in 3 hours. If you have deep enough pockets for this one, look no further. The last year’s model was pure perfection and this one has managed to top it. SkyBound USA has introduced this 15 feet outdoor trampoline hoping it would bring about a revolution in the world of trampolines – and we have to say it’s not far from that. 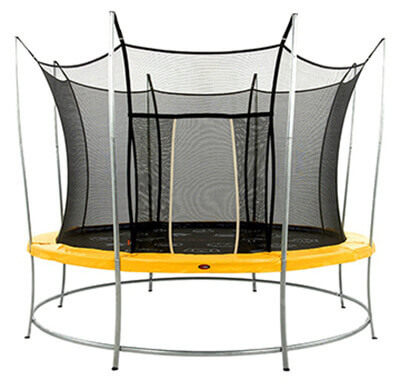 SkyBound prides itself on building and designing top trampolines that are easy to assemble. This one is no exception. 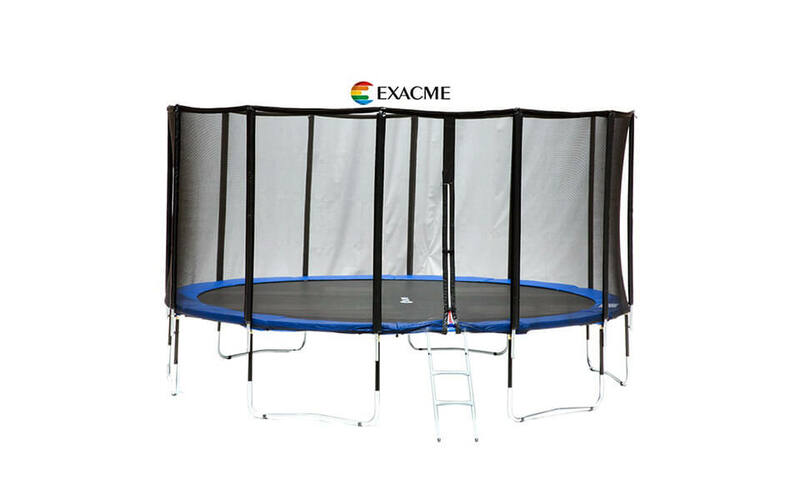 From the moment you start opening boxes and unpacking this trampoline you will have great first impression and it will be clear as day that you are going to try something extraordinary. Build quality of this trampoline is something unprecedented and can only be found in way more expensive models, like “AlleyOOP Power DoubleBounce” or in springless trampolines. The enclosure is safe – the net covers the inside of the trampoline and the poles are curved to add an extra safety layer. It looks good to, with its sleek curved lines. The trampoline can be left outside as the poles and legs are galvanized to prevent the formation of rust. The mat is UV resistant and long lasting. The bounce is excellent thanks to 84 premium gold zinc springs 8.5 inches long and it can bear a maximum of 330 lbs., enough for plus-sized individuals. The assembly is simple as it doesn’t require any screws, nuts and bolts, but as it isn’t a small trampoline, an extra pair of hands would help immensely; you should be able to assemble it in under two hours. The warranty is satisfactory, especially on the metal parts, but a year on the pad and 6 months on the spring is not bad as well. The only con is the comparably high price of about $750, but for such great build quality it’s far from a bad deal. When it comes to safety regulations, SkyBound Stratos not only met ASTM requirements but they did exceed every one of them. 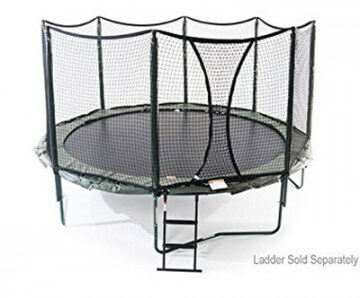 As SkyBound stated during product launch marketing campaign – they do not want a trampoline, they wanted THE trampoline which will be seen as category leader. And we can say that they did succeed with it. It definitely is one of our top picks for season 2018 and can easily be one of the top rated trampolines you can buy today and one of the best trampolines in this price range. The new addition to the great Vuly family is the Vuly Lite. It’s a somewhat basic trampoline, 12 ft. in diameter. Unlike the rest of the high-end Vuly range, the goal here was to build an affordable trampoline that’s still miles ahead of the rest of the low-end offerings. Thanks to their expertise in building good trampolines, Vuly has some of that edge too. 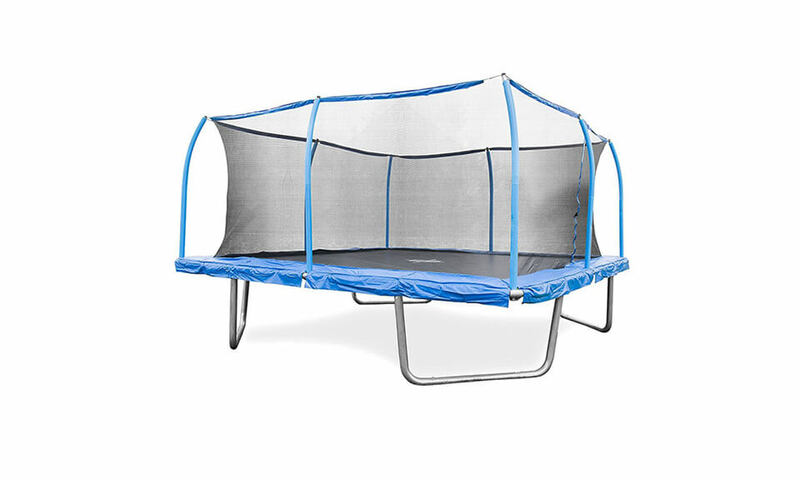 The rigid frame reinforced with two steel rings that keep the trampoline steady is the same as with its more upscale sibling, the Vuly 2. However, unlike the Vuly 2, which has a nice black color to the poles thanks to powder coating, here they are left dull metallic grey. It doesn’t affect the functionality, though. The bounce is good and responsive thanks to 72 tapered coil springs. This is standard for 12 ft. trampolines. The mat is very well-stitched and comes with various shapes painted on for VulyHexVex game, which is standard Vuly fare. The safety pads are reversible and feature yellow or blue designs. They’re made of Bisonyl and will resist most types of weather. The enclosure net is excellent. While made from polyethylene insead of better quality Silk Terylene as in Vuly 2, it didn’t budge when we fell onto it from quite a distance. Note: The reviewer weighs 220 lbs. so the result is even better than it seems. This also means that the advertised weight limit of 240 lbs. is likely conservative. While obviously some corners were cut, this trampoline is still miles away than the generic trampolines you can see and buy for not much less money. The warranty and customer support are also well above the cheaper brands. This trampoline is a tad more expensive, but you get a sense of security and quality you just can’t get with cheaper brands, even if you’re sacrificing a bit of value in the process. 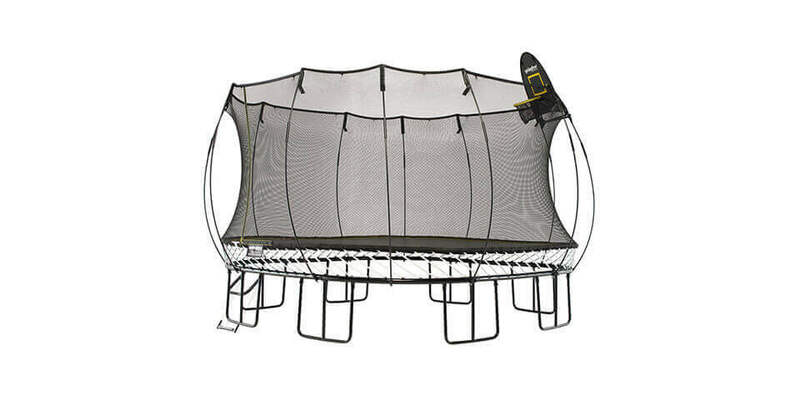 We recommend this trampoline if you’re a newbie and want a trampoline that just works. If you’d like something more upscale, look for Vuly 2 and Springfree. 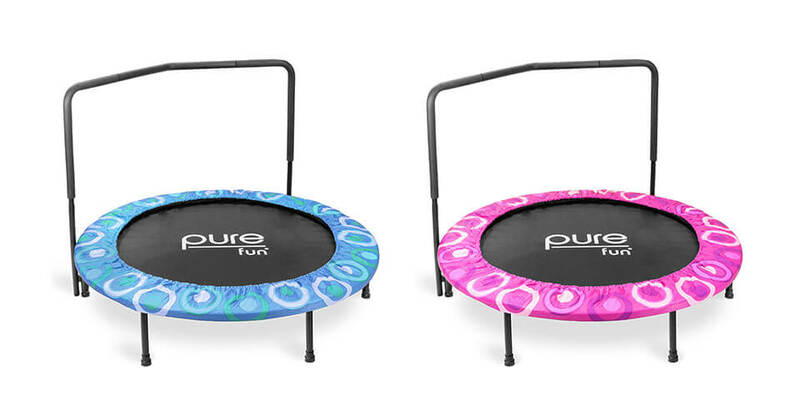 If you’re in the market for something cheaper, PureFun DuraBounce and Skybound Cirrus could be to your liking. This is an another quality offering from ACON. Compared with the ‘Premium’ version of this trampoline, the poles aren’t pointing away from the enclosure, but this trampoline is built so well that it definitely deserves the title. In line with fond ACON tradition, the trampoline doesn’t have a posted weight limit. This doesn’t mean there isn’t any, but good golly you’d have to try really hard to overload this one, even on purpose. Those 0.8 inches thick frame tubes can take on a lot of weight. 96 springs, above average for this size, are 8.5-inches long and have a preload force of 96N (most manufacturers even don’t provide the number) ensure for providing a smooth, high bounce. 6 times cross-sewn polypropylene mat is literally built to last. The only thing we’d like is that the safety pad were a bit thicker. It comes with a spring tool for easier installation and the instructions are simple. We are extremely satisfied with 5 year warranty on the mat and the frame. 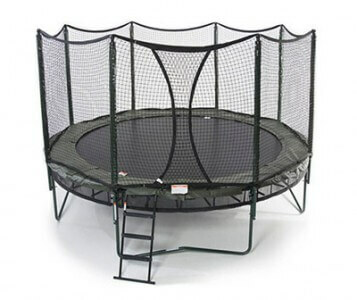 It can be left outside no problem, as it is a heavy duty trampoline. Again, ACON trampolines aren’t known for their bargain bin prices, so expect to pay a premium over run-of-the-mill trampoline brands. But you really do get what you pay for, and in this case, you get A LOT. 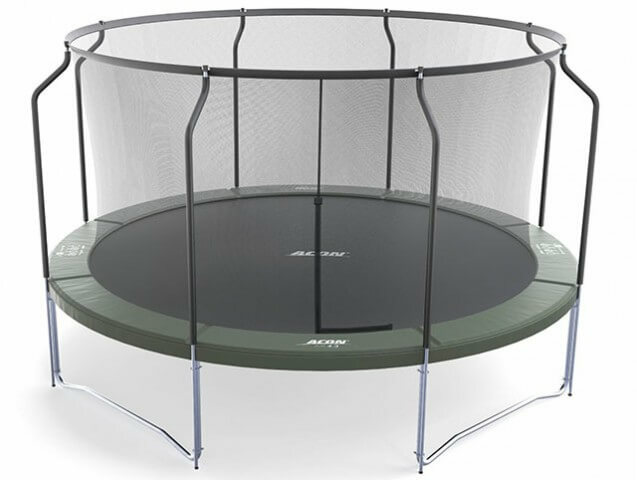 If interested in this fantastic trampoline, which we gave total rating of 4.5*, please read a bit detailed review and decide if Acon Air 4.3 is trampoline for you! Upper Bounce 15x9ft is a trampoline whose designers used every single inch of free space and made it small enough (assembled size 168×96″) but with jumping mat size exactly as name indicates – spacious. Trampoline is very sturdy and with total trampoline weight of 290 lbs (130kg) it will make sure that will stay in place no matter what. It features great responsive mat made from polypropylene mesh material with 8 rows of stitching, ensuring that jumping mat will probably be last thing that will fall apart. What we haven`t like is not so thick frame but as manufacturer guarantees that will hold up to 500 lbs (230kg) we have bo other option than believe it. And now, why we liked it – because it looks cool! 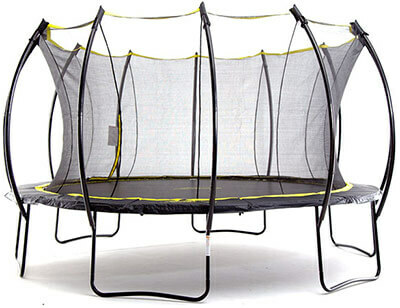 It is one of the nicest rectangle trampolines you can find on the market. Regarding assembly, it must be done by two man team and it can be done under 2 hrs as instructions are very easy to follow. 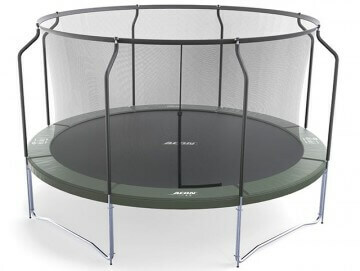 This trampoline makes a good purchase for all aspiring gymnasts and even competitive jumpers. 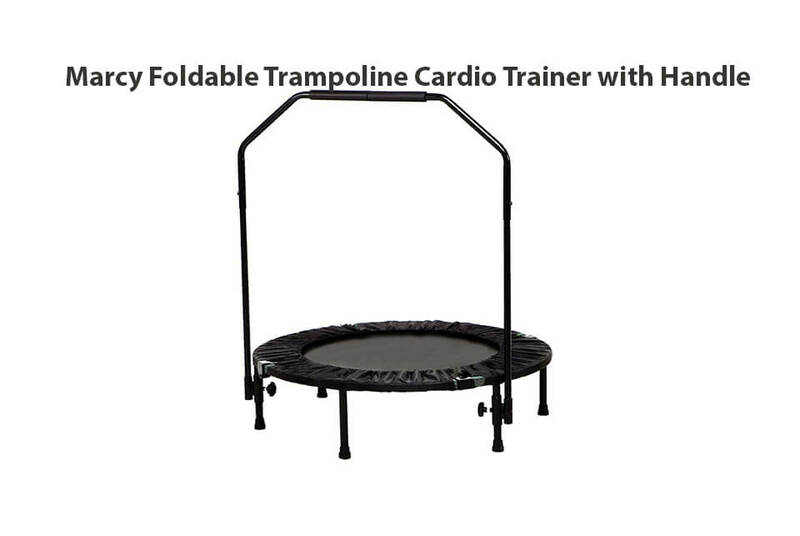 Perfect for families where all family members would use this trampoline. Get this Upper Bounce rectangular trampoline and you’re in for the bouncing experience of your life! If you have chance, buy it. Exacme enters the arena guns blazing. By sprinkling magic words like ‘luxury’ and ‘fibre’ it aims to swoon us into just letting it slide. Uh-oh! Little do they know… of course it’s being put to the test. We were a bit apprehensive during ordering when we saw the marvels of English in the description, with gems such as “Not bare any metal” and similar. But if we’ve learnt anything, it’s that the language of engineering is universal, so we didn’t discount this trampoline. And it’s a good thing we didn’t. Exacme is very proud of its sturdy fiberglass frame which supposedly makes it safer. It is safer compared with steel poles, no question there, but it’s an old-school design with the springs remaining inside the enclosure. It’s also lighter and easier to set up. The mesh is also good, and these poles give the otherwise boring unit a souped-up look. It’s a 15 feet unit, standing on 6 legs with 12 poles. Its 108 springs is nothing short of amazing, along with a 400 lbs. rated weight limit. We didn’t have to drill anything, as it uses a T-joint system. You’ll have to pull all of the springs one by one, but you get the tool. Be warned: It’s still time-consuming. You also get a free ladder. We have to say we’re impressed by how well-built this thing is. The bounce is not phenomenal, but the stability of the frame just about is. This sports almost double the weight limit of similar, lower-end trampolines. For such a modest asking price, you’d have to be brazen enough to ask for more. Yes, it’s a bit unrefined and rough around the edges, but the sheer value is compensation enough. 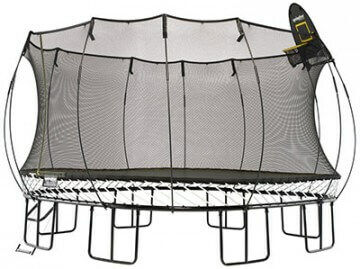 Definitely one of the best-buy trampolines of this season. 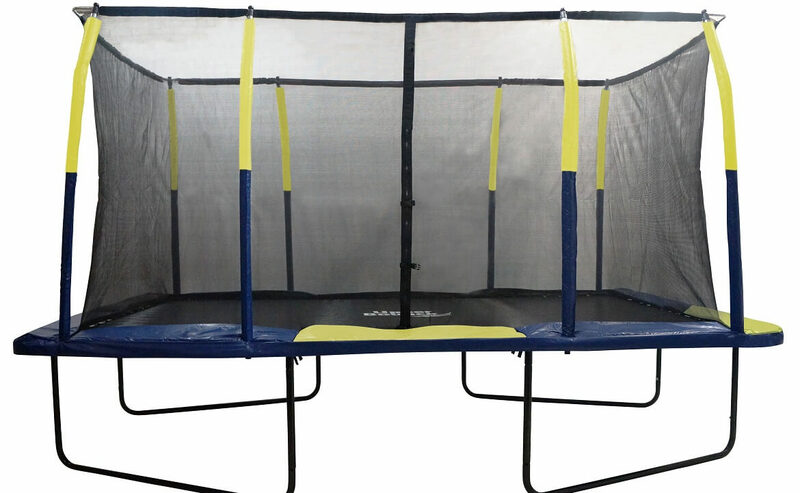 Just like the AlleyOOP DoubleBounce, this model also packs a punch with its great innovative solutions that make the trampoline experience safer and even more pleasant. While not as high end as the PowerBounce technology, the VariableBounce has a lot to offer. The bounce is variable, which means that some springs engage earlier than others, which means that the fall is more gradual. There is a total of 96 springs, each 8.5 inches long. They let the jumper absorb the impact forces over a larger period of time, thus reducing the risk of injury. The jumper decelerates more slowly and gradually, which also helps with the quality of bounce, as the jumper will absorb less energy, meaning more of it is returned from the springs – making the bounce higher and better! 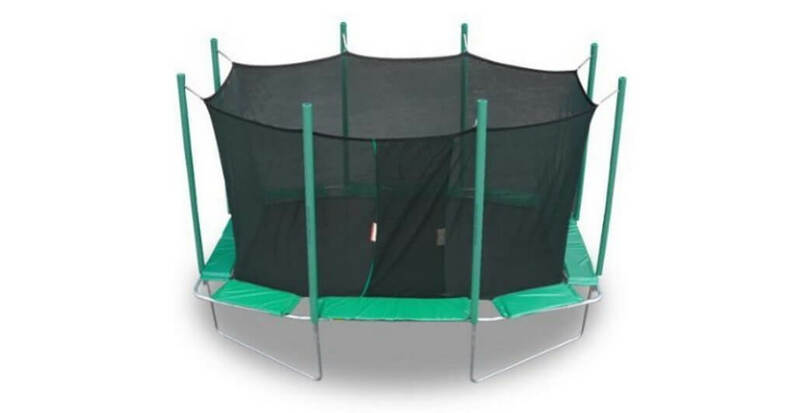 The trampoline comes in dark green color but otherwise isn’t anything special when it comes to looks. 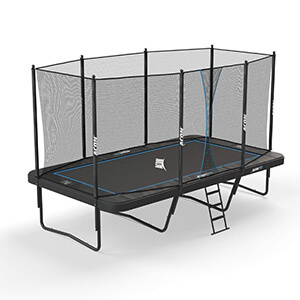 The enclosure is very strong – sturdy and keeps you safe and the trampoline is well-padded where it matters. There are only four legs; this is not a problem in itself, but for such a premium trampoline at a premium price they shouldn’t have skimped on that. But it is built to last and the have been accounts of the trampoline lasting for a decade and even more and their customer service is phenomenal. Jumpsport posts a weight limit of 245 lbs. Unfortunately, the trampoline is pricey and doesn’t even come with attachments that you’d be happy to have – mainly, the ladder, but also the basketball hoop and the tent. But if you can afford it, it’s an excellent choice, even when compared with the DoubleBounce model, as it is a fair bit cheaper. If 12 ft. model is a bit too small for you don`t worry as larger models are also available. Staying on trampoline – Fun games to play that will keep your child on trampoline for days to follow! Do you like an idea of having fun and exercise in the same time? Everybody does! As with every toy they probably had, which they used to play for several hours or days and then ditch into some corner of the room, we have to say that it is no different with trampolines. But, as there is whole bunch of fun game ideas to play we can say for sure that your kids will surely find something they like. Among 20 trampoline games we described here some of them are not really aligned with safety guidelines, especially when it comes to number of people on the trampoline, but we strongly feel that if games will be played under constant supervision no problems issues should occur. But if you need trampoline game ideas then check our top list of fun trampoline games. Trampoline is not a kindergarten and never forget that. Constant supervision of jumpers, especially kids, is required at all times. Having a safety enclosure does not change a thing, so please do not leave your children without supervision. So far we’ve been please with Kidwise products. They’ve usually been regular mid-range trampolines. Obviously, someone in the company thought that wasn’t exciting enough and decided to come out with an rectagonal trampoline. What was it like? Read more here!